I just LOVE paper crafts and all the things you can do with paper these days. To say there has been a paper explosion during the last few years would be putting it mildly. 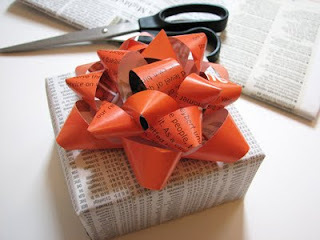 When I was a kid (yes, back in the stone age) we used newspaper for crafting purposes. Copyright © 2010 - All Rights Reserved - Written By Jessica Jones of Jessica Jones. Here's what Jessica had to say about her tutorial: I learned to make paper flowers a long time ago with directions from a library book. They don't require any adhesive, and there are just four shapes to cut out. Here's what Jessica had to say about her tutorial: When I bought something at a store recently, the clerk handed me my purchase in a bag made from a newspaper. 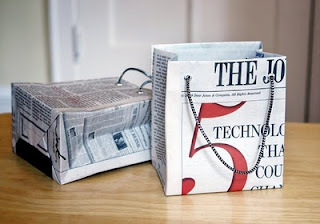 I liked it very much and had to make some more—thus today's DIY recycled newspaper project: gift bags made from the Wall Street Journal. You can vary the dimensions, of course, but here's what I used to create a bag that's 5" tall, 4.5" wide, and 3" deep. Copyright © 2009 - All Rights Reserved - Written By Jessica Jones of Jessica Jones. 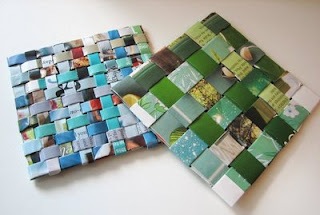 Here's what Jessica had to say about her tutorial: My latest after-dinner-while-watching-TV project: woven coasters made from magazine pages. Copyright © 2007-2010 - All Rights Reserved - Jessica Jones of Jessica Jones. Jessica is a professional graphic and textile designer. 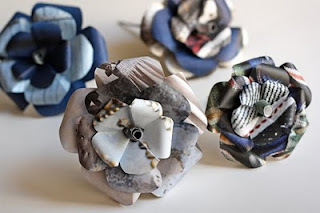 Please visit her Jessica Jones website @ http://www.jessicajonesdesign.com/ and her How About Orange blog @ http://howaboutorange.blogspot.com/.